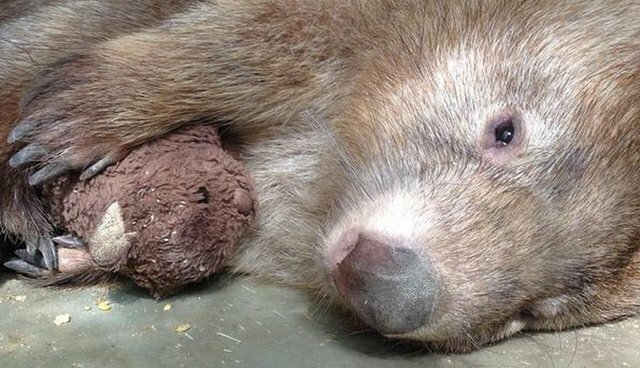 Tonka, a 7-year-old wombat, lost everything he ever knew: his home, his mom and any sense of stability in his life. He was rescued by the Billabong Sanctuary, where he was diagnosed with depression - and ever since then, the one thing in the whole world that brings him the most comfort is his teddy bear. Samm on Instagram: "#TonkatheWombat cuddling his teddy bear. #mybestfriendisawombat #wombatweekends #ILoveMyJob #BillabongSanctuary"
Tonka was only a baby when his mom was tragically hit by a car, and he was taken in by the sanctuary in Townsville, Australia. In 2011, Billabong was hit by a cyclone and required massive repairs. All of this change and heartbreak was too much for sensitive Tonka. Now, back at the repaired sanctuary, the staff deals with Tonka's depression the best they know how - with teddy bears. "Animals that are clinically depressed likely have the same problems as do humans with the condition - the brains of all mammals are remarkably the same," Kenneth B. Storey, a professor of biochemistry at Carleton University, told The Dodo. Samm on Instagram: "After a long day of people saying hi #Tonkathewombat has a nice snooze in his sand pit. #ilovemyjob #mybestfriendisawombat #wombatweekends..."
Tonka is so attached to his stuffed friend that his comfort toy has to be replaced often, as he is constantly tearing holes through them. Occasionally, Tonka will even get a stuffed wombat, as his handler Samm Sherman posted about on her Instagram account. Sherman, who has the most interaction with Tonka, is his best friend. A staff member at the sanctuary, she's very affectionate with him and posts about him on her Instagram frequently with the endearing hashtag #mybestfriendisawombat. Samm on Instagram: "Good morning #SleepyHead as #TonkatheWombat wakes up so I can clean out his burrow! #BillabongSanctuary #mybestfriendisawombat..."
Animals of course can't tell us if they're depressed, but evidence suggests that they most certainly do experience the blues. "We measure interest in food that animals like a lot or in motivation for sexual activity. We also measure how they are interacting socially with other animals in the group, and changes in sleep patterns and daytime activities," Olivier Berton of The University of Pennsylvania told National Geographic. "Another behavior that has been used frequently to measure animal depression is whether they readily give up when exposed to a stressful situation," he said. Samm on Instagram: "#TonkatheWombat so happy to see me and get his morning cuddles!!! #mybestfriendisawombat #BillabongSanctuary #ILoveMyJob #WombatWeekends..."
We cannot know for sure exactly how Tonka feels, but at least his stuffed friends are able to bring him a little bit of joy.